My wife, Linda, delivered our daughter in February of 1992. Katherine suffered a catastrophic birth accident and died seven months later from complications. Grief took us down different paths, which is quite common. And most of our energy, during Katie’s short life, was devoted to caring for a damaged child. But after her death, we began to emerge from a deep dark tunnel and blink at the light of the living world around us. Linda devoted her considerable financial skills, acquired during a career on Wall St., to a school for blind children in Denver where Katie had been a ‘student’. I, on the other hand, got up from a nap on a bright, cold Colorado winter’s day, with Linda sleeping soundly beside me, and began to pen a short story about the rescue of a child, who had died, from an ancient being. The short story has become a series of three novels comprising The Ur Legend, of which the first two have been published. Writing, I’ve found, is not about making the time or having the skill, but finding the reason. I wanted to give Katie a life, as Ur, she hadn’t had the chance to live. Fantasy is a great genre for making the impossible possible. So I was fortunate that fantasy is all that flows from my pen and onto the page. How did I imagine Ur? Well, like most parents, I guess, I wanted my daughter to exceed the bar I had set living my own life. So I made her a being who could hold worlds together with her mind. Katie’s mind had been erased by lack of oxygen. How would I fashion her personality? Katie had never smiled, so neither did Ur, and this made her a serious little girl, which I suppose is important if you’re going to hold the cosmos together! But she was still a little girl. As her father in the book, Jaq, said: “sometimes she sounds like Pollyanna and sometimes she sounds like Plato.” And Ur had to have some gaps, as Katie certainly did. Ur struggled relating to the subtleties of human interaction. She exhibited characteristics of high functioning autism, I guess, not being an expert on the condition. But Ur’s personality didn’t flow from a notion I had; rather it emerged, like a sculpture, from within the block of marble where it had been hidden, not unlike the unfolding of most personalities. And as I reflected back on my stories, I realized another surprising thread that was not the result of any conscious intention. All of the women in my books were strong. While they were not always right, they were all possessed of tremendous self-confidence. The men? They were a mess. Uncertain, unsure, searching for their centers. Why? I suppose because my characters were a reflection of my own attitudes. The three most important people in my life, those who have shaped who I am, have been women. Two are gone now but their influence is not. Their strength, deriving from absolute confidence in their centers, has given me a model to emulate. 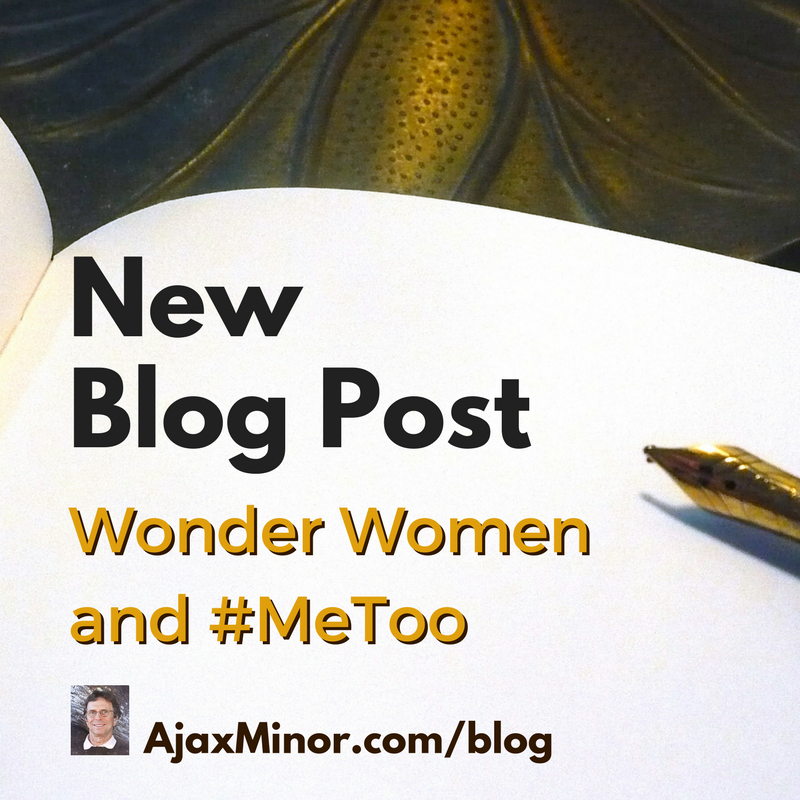 women who, like Wonder Woman, were not simply Empowered but were Powerful. They had ideals, expressed in purposeful action, that came from inside. They set goals that were consistent with the people they themselves were within. Centered and comfortable in their own skins. 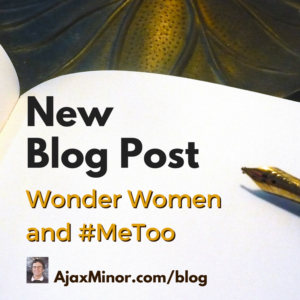 And Ur as a young woman in Ipanema, like Wonder Woman, also allowed herself to open up to the possibility of deeper human connection and love. Here’s the thing. Empowerment is important, but the trick is to take that gift and have it become transformative, allowing women to project their ideals and their beauty to the world outside of themselves. And if we’re lucky enough to meet or fall in love with one of these girls, they are even capable of making us poor, confused men the superheroes we’d like to be.